Many items on this page are provided in PDF format so they can be printed more easily. Adobe Acrobat Reader is required. If you do not have this free software, click the Adobe logo to go to the Adobe website to download the reader. On this page, items and links you click may open on top of this web page (in a new window or tab) or you may have to use your browser's back button to navigate back to this page when you finish reading and/or printing the instructions.. The Beginner's Guide to Smocking is a free tool that you may want to print and keep as a reference when you are learning to smock. Click the diagram on the right to open this free guide. 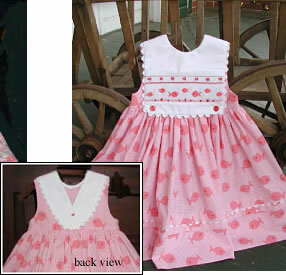 Diane Bruce's smocking designs typically include detailed graphs and helpful information. Because these details create a large file size, the most efficient way to deliver these two free designs to you is via email. If you would like to receive either (or both) design as an email attachment, click nancy@creativekeepsake to open an email form. Next, type "email bees" or "cupcakes" in the email subject line & then hit send. If that email link does not work, you can contact us using any email program. 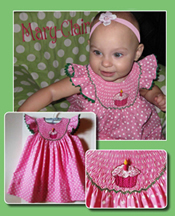 Send your request to nancy@creativekeepsake.com"
A note to the beginning smocker . . . While you wait for our email reply, you may find it helpful to open and print our "Beginner's Guide to Smocking", so you can have this guide readily available when you smock this design. 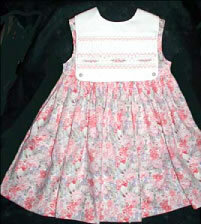 Many machine embroidery designs can be stitched to create a "shadow embroidery" effect. 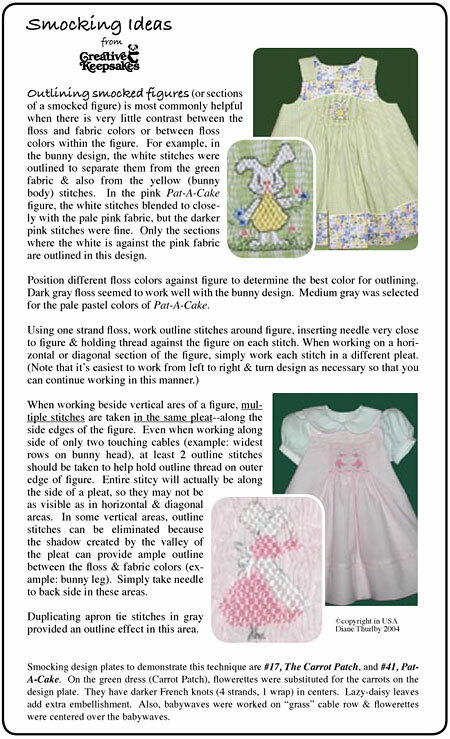 Direcions below apply to our machine embroidery design, "Hoppy Cottontails" but the same idea may apply to other designs. Study these directions to see if the steps might be adapted to another favorite design. 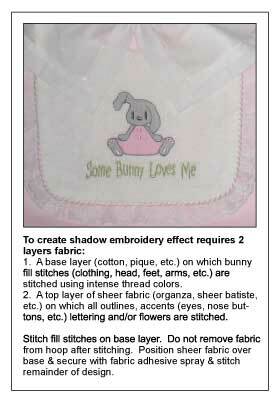 To create the "shadow" effect using "Hoppy Cottontails" stitch as directed below. 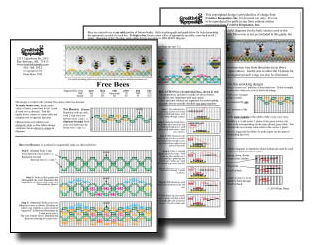 Click here to view purchasing info for "Hoppy Cottontails" machine embroidery. The following pattern adaptations are designed to be used with the Creative Keepsakes garment patterns indicated. Note that some adaptations include two pages of instructions. You will need to click (to open and print) each page number for the complete directions. You can use this sheet as a companion to all of the buckle patterns - Buckle Jumper, Jumpsuit, & Bubble! 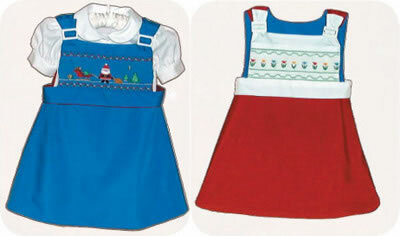 The red jumper is actually the same jumper simply reversed to red side, shown with Tulips (design #39) smocked on white bib. According to the following suggested measurements make frequent marks below pattern cutting line (bottom edge) following curve of jumper hemline: sz 1 = 1/2", sz 2 = 2", sz 3 = 3", sz 4 = 3". Connect these marks to create a new cutting line for hem. Click the flyer image to download a larger PDF file of these instructions. Feel free to print the flyer. 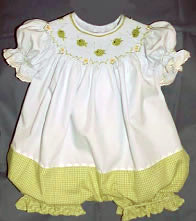 Smocking designs used to demonstrate this technique are #17, The Carrot Patch and #41, Pat-a-cake.